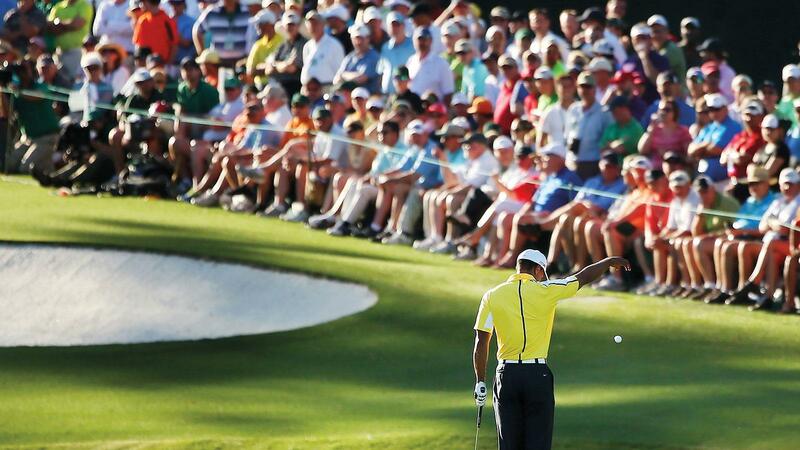 The most famous mistaken drop in Masters history, made by Tiger Woods in 2013, was caught by an eagle-eyed TV viewer. On a perfectly pure Sunday afternoon in April of 2017, Lexi Thompson was leading the ANA Inspiration by two strokes and cruising. It was the first LPGA major of the year, and was the tour’s flagship event. Thompson won it in 2014 when it was called the Kraft Nabisco Championship, and while she had achieved superstar status, that remained her sole victory in a major event. She seemed poised to double up as she played the back nine. As Thompson walked to the 13th tee, tour officials confronted her with some decidedly bad news. She was being penalized for incorrectly replacing her ball on the 17th green of Saturday’s round, the result of a television viewer notifying the LPGA by e-mail. She was being assessed two strokes for the incorrect replacement, and another two strokes for signing an incorrect scorecard for the Saturday round. “Are you kidding?” she replied. She went from two shots up to two shots down. Tearing up, Thompson gamely trundled on, losing the tournament in a playoff. But the golf world was shaken by what had happened to her. For nearly four decades there had been a series of rules infractions pointed out by viewers citing a breach of the rules that led to penalties being assessed, some leading to disqualification. Why, professional players had been asking for years, are people outside the ropes, outside the golf course or even outside the state, allowed to weigh in on rules infractions? In a sport where honesty is the only policy, where players call infractions on themselves, why do television viewers have any say at all? As of 2018, they don’t. In December of 2017, the USGA and the Royal & Ancient, in conjunction with the professional golf tours, announced that television viewer input would no longer be considered. Watch, don’t tell. The rulers of golf announced that officials will be designated to watch the television broadcast and make rulings when deemed necessary. Those assessments are to be based on “reasonable judgment” and “naked eye” standards, and not ultra-slo-mo, hi-definition reviews. Additionally, the two-stroke penalty for signing an incorrect scorecard when the player did not know they had violated the rules was eliminated. At least one player had been penalized by the new video review procedure by early May. Nicole Broch Larsen was penalized one shot for causing her ball to move while at rest during the second round of the LPGA’s Volunteers of America Texas Classic. Broch Larsen thought she had finished at 7 under, but was told that a video review had found she caused her ball to move on the fourth hole. Instead of a birdie, the penalty gave her a par. An on-course rules official, after being consulted by Broch Larsen, deemed there was no penalty against her. Because she was following the direction of the official, Broch Larsen did not receive an additional penalty from playing her ball from the wrong place. In light of these changes, Cigar Aficionado is recapping 10 of the most famous television viewer incursions into the golf rules world, including one that involved the most famous player of the 21st Century. On the 17th hole of Mission Hills Country Club in Rancho Mirage, California, Lexi Thompson was leading the ANA Inspiration Tournament on Saturday afternoon and everything was going along swimmingly. She had marked her ball before putting, but when she replaced it, a television viewer noticed that she didn’t seem to place it back in front of her mark, but somewhat off to the side. Well after the round had concluded, an e-mail to the LPGA was passed along to officials. Thompson was leading by two shots after 12 holes on Sunday. That’s when she was approached by LPGA officials and told that she was being assessed four penalty strokes for her actions on Saturday, two strokes for not replacing the ball correctly and two strokes for signing an incorrect scorecard. She went from the lead to trailing by a stroke, and was clearly emotionally shaken. Thompson made three birdies coming in to tie So Yeon Ryu, forcing a playoff that she lost. But in the end, she likely won enough sympathy from major golf officials across the board that the input of television viewers would no longer be allowed. Probably the most famous viewer intrusion of its time was Craig Stadler’s penalty and eventual disqualification from the 1987 Shearson Lehman Brothers Andy Williams Open in San Diego. Stadler had thrown in the towel, or rather, it was thrown at him. On the 14th hole in the Saturday round, Stadler’s wayward drive ended up in the rough under a cypress tree with low hanging branches. The only way Stadler could play any kind of shot was from his knees, trying to scythe the ball from under the branches. The area was mucky from overnight rain and he didn’t want to get his white pants messy, so he took a towel from his bag and laid it on the grass, then knelt down on it to chop at a ball that went only a few feet. On Sunday afternoon, the opening of the television broadcast replayed the incident. That’s when several viewers called the tournament, wondering if Stadler might have violated a rule about building a stance—that is creating a favorable stance artificially. But none of this was relayed to him during the round. He made a 35-footer for birdie on the 18th hole to finish in a threeway-tie for second place—or so he thought. “I walk off the green and [PGA Tour rules official] Glenn Tait is standing there and says, ‘Nice putt, don’t sign your card,’ ” Stadler says. After a discussion in the rules trailer, Stadler was penalized two strokes for the Saturday round, and since he had signed for a lower score he was disqualified. That $37,500 check got canceled. Stadler did get a measure of revenge. When the tree was dying in 1995, he was invited to help cut it down. “Gladly,” he says. This might be the first high-profile viewer call-in that led to a very high-profile player being penalized. It was not what was seen, but what was heard. During the final round of the Tournament of Champions at La Costa in 1980, Tom Watson was playing with Lee Trevino. Watson was leading by a bunch, on cruise control. Trevino wasn’t playing up to his standard and had been grousing about it. Then a microphone on a tee picked up Watson giving Trevino advice about his stance and ball position. Under the rules of golf, players are not allowed to give advice to other players during the round. The overarching label for this is “protecting the field.” A viewer called the La Costa Resort and the information was relayed to Tour officials. When Watson completed his round, he was told about the infraction and the ensuing two-shot penalty. He signed a scorecard for two strokes higher, but won the tournament anyway. Two years later at the exact same tournament on the exact same course, Ron Streck ran afoul of another television viewer. Streck was in contention on Sunday when his drive on the 16th hole ended up under a tree. The television camera was on him as he attempted to take a stance in the awkward situation, with a small twig of a branch in his face. Streck bent, then broke the twig before playing his shot. The phone rang at the resort. Apparently more than one viewer was questioning whether breaking the twig was allowed under the rules of golf. It was not. You can bend, but you can’t break. Streck ended up with a disappointing three-putt on the 18th hole that knocked him out of a share of the lead, but it didn’t matter because Lanny Wadkins took control on the way home. Streck thought he had finished in solo second place. In the scoring trailer he was told by officials that he was being penalized two shots for the twig incident, and that penalty dropped him into a tie for second, costing him more than $14,000. In August 2010, Juli Inkster was in contention at the LPGA’s Safeway Classic in North Plains, Oregon. She was stuck with a long delay on the 10th tee during the second round with nothing much to do but wait. After nearly a half hour, she decided to loosen up with some practice swings, but instead of simply swinging a club, she took out a training device, a donut-shaped ring that adds weight to the clubhead to stretch the muscles a bit. It was clearly a training aid. A viewer reached the tournament and questioned the legality of such a maneuver. The LPGA officials contacted the USGA about it, but it was pretty clear—using a swing aid during play, even when not using it to make an official stroke—is a serious breach of the rules. Paul Azinger shot a 69 in the first round of the 1991 Doral Ryder Open, after making bogey on the 18th after he had hit his tee ball into the water hazard down the left. The ball was just barely in the hazard, so Azinger decided to take off his shoes and socks and play the ball from the water, with the television camera recording the rare aquatic adventure. As he tried to get a solid stance, he moved a piece of coral with his foot. He managed to smash the ball out a few yards, eliminating the need for a penalty drop. A television viewer saw it and the next day managed to reach rules officials to report the incident, saying that Azinger had moved a loose impediment in a hazard, a breach of the rules. When officials reviewed the tape, they concurred. Since they were concurring on Friday, a day later, that was particularly bad news. They informed Azinger that he was being assessed a two-shot penalty for the infraction, and because it was being added to his first-round scorecard, he would be disqualified for signing for a lower score. Azinger appealed directly to PGA commissioner Deane Beman about it, but Beman said there was nothing he could do, that rules officials make the calls. Camilo Villegas had missed the 15th green on the Plantation Course at Kapalua during the first round of the 2011 Tournament of Champions. It was down a slippery slope and required a delicate pitch to get the ball up the bank and anywhere close to the hole. Villegas’ first effort didn’t reach the green surface and rolled back down the hill. His second attempt did the same thing, though this time—as the ball was still moving—Villegas used his wedge to swat away a morsel of divot clump. A viewer placed a phone call to Maui to report that Villegas had broken a rule. And so he had. When the ball is in motion, you cannot remove any loose impediment that might influence the ball’s movement and final resting place. It was clearly moving toward the detritus of Villegas’ divot. Villegas had finished his round and signed his scorecard when he was informed the next day of the penalty, which led to automatic disqualification at the time. “If somebody called something in, I probably did something wrong,” he said with a shrug on that Friday, which was his birthday. At the LPGA Founders Cup in 2013, Stacy Lewis was humming along nicely in contention on Saturday when she drove a ball into a fairway bunker on the 16th hole. She and her caddie Travis Wilson were standing in the bunker contemplating the shot. A Golf Channel viewer thought that Wilson had moved his foot deliberately in the sand and contacted the tournament. The question was if Wilson was testing the sand, which would be a penalty. When Lewis walked off the 18th green after making a birdie, she thought she had shot 66. But LPGA officials were there to report that there might be an infraction and she and her caddie were asked to come to the scoring trailer to review footage of the situation in the bunker on 16. The video was slowed down and she could see Wilson’s foot move and hear the crunch of the sand. At the time, their discussion was about the sand itself with Lewis asking Wilson about its firmness. Since neither caddie nor player is allowed to test the condition of sand in a designated bunker, it was a two-shot penalty. She had to sign for a 68. There was a happy ending. She trailed by four shots going into the final round instead of two, but she blistered the course for a 64 on Sunday to win. Lee Janzen was amazed that his putt on the 17th green, sitting right on the lip of the cup, hadn’t fallen in. It was the first round of the 1998 World Series of Golf at the Firestone Country Club and Janzen, coming off his second U.S. Open victory that summer, was having a decent day. But why wouldn’t this putt drop? Then it did, probably a good 20 seconds after it had reached the lip. The crowd cheered and Janzen was pleased with his birdie 3. When Janzen arrived at the course the following morning, on his 34th birthday, tour officials wanted to see him. A television viewer had gotten a phone message through that Janzen had violated a rule by taking more than 10 seconds to stroke the next putt. Timing a video review, it was clear that he had taken at least 20. The rules of golf state that if a putt on the lip hangs there for more than 10 seconds it is deemed to have come to rest and the next stroke must be played. Jansen waited too long, and in doing so should have assessed himself a two-shot penalty. He didn’t and thus was disqualified. The Tiger Woods saga at the 2013 Masters went from late on Friday afternoon until the next morning, with a flurry of phone calls, texts and discussions. It all started with Woods’ shot on the 15th hole, which was too perfect. Forced to lay up on the par 5, his wedge approach struck the flagstick and rebounded back into the pond in front of the green. So now Woods had to take a penalty drop from where he hit that pitch. Where he took that drop was questioned by a television viewer. Not just any television viewer, not just any armchair arbiter: This was David Eger, a former USGA and PGA Tour tournament official who had worked the Masters, was an expert in the rules of golf and now was a Champions Tour player. Eger was home in Florida, watching the Masters on TV and helping his wife with some gardening, going in and out of the house. When he took a look at the telecast he noticed that Woods had lost a shot. Wondering what happened, he rewound the coverage and saw Woods dunk his pitch on 15, then take a drop. Rewinding it several times, he noticed that Woods had dropped the ball in the wrong place. Eger needed to contact someone in a hurry: if it was also noticed by others, but after Woods signed his card, he could be disqualified for not adding two shots. “I knew it was going to be a penalty. I was just trying to save Tiger,” Eger told Cigar Aficionado. The rules of golf required Woods to drop the ball as close to where he played it from as possible. There was a divot hole from that previous shot, but he dropped it several feet behind that divot. He did not request help from rules officials on the drop, and in a quick ESPN interview after signing his card, he said he had dropped it about two yards behind the divot hole. The interview came after he signed his card, the thing that Eger was trying to prevent. Eger had immediately called PGA Tour official Michael Bradley who was working the tournament, but he had just left the grounds. He also sent a text to him outlining the violation. The drop had been seen on video by officials at the course, but nothing was said. Bradley reached Fred Ridley, then the Augusta competition committee chairman (and today the club chairman) who first said the distance that Woods had dropped from the divot was “splitting hairs.” But later that evening, CBS commentator Jim Nantz told Ridley of Woods’ comment on the ESPN show and that there was Twitter chatter about the legality of the drop. On Saturday morning, Ridley and rules officials met with Woods and decided that he had taken an incorrect drop and would be penalized two strokes but would not be disqualified, certainly owing to the fact that Ridley at first didn’t think Woods had done anything wrong. Eger’s call, while adding two shots to Woods’ scorecard, likely ended up preventing him from being disqualified. Jeff Williams is a Cigar Aficionado contributing editor.